So, it turns out the rumours were true! A little over a year ago, Swedish sport gear manufacturer Byxor & Strunt stated that they had been collaborating with hydraulics giant Spot Industries to develop a new product. 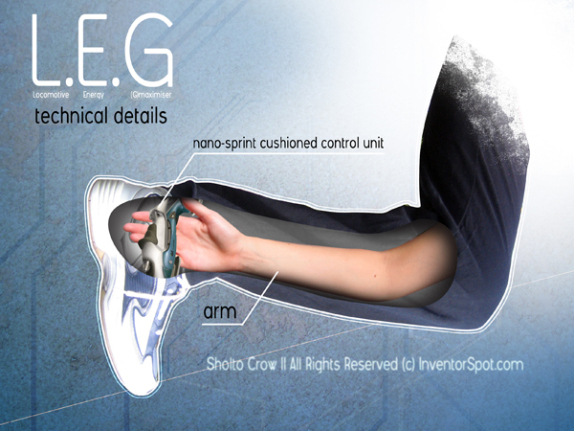 They hinted that this new product, if brought to fruition, would revolutionise running as we know it. Since the announcement, in late June 2007, hearsay has discarded some of the more far-fetched tittle-tattle (personal teleportation units shaped like giant shoes; exploding shoes; shoe-flavoured running potions etc), whittled itself into the more streamlined speculation, which flourished into a grapevine down which whispers hit the street as word. The word on the street was: LEG. 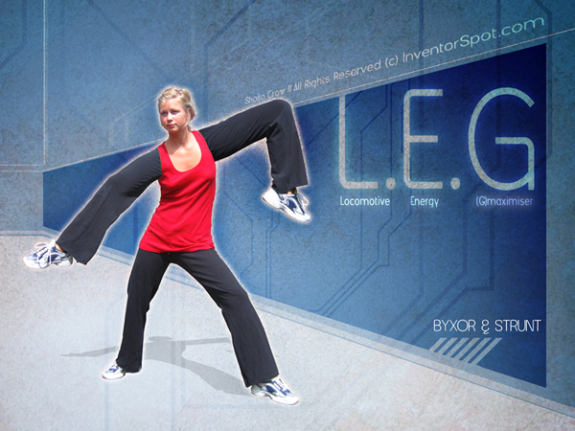 The Locomotive Energy (G)maximiser - a hydraulic leg which fits over the arms and is controlled with a nano-sprint cushioned control unit, is set to rock the world of running, walking and everything in between, says Eric Svensson, CEO of Byxor & Strunt. "The LEG unit will join the thumb , the wheel and cheese as one of the most important breakthroughs in human capacity and creativity. Not only will the LEG break all speed records for human self transportation, it will also reduce our reliance on the motor vehicle, thus contributing to a reduction in carbon emissions." "With two legs one can achieve speeds of up to 15 mph or, in the case of a top athelete like Michael Johnson, 23mph, using around 200 steps per minute. With four legs we can expect to almost double that speed. Of course the technique is quite complex and not yet perfected so it will take time to get up to those levels but at least popping to the shops for milk will now be relatively rapid." When asked about the spelling of the word ‘maximiser' in the LEG acronym, Svensson explained simply that "we couldn't think of a good word which began with ‘G' so we put it in brackets at the beginning of maximiser in order to justify the acronym, which had to be LEG, as I'm sure you'll appreciate. Gmaximiser means the same as maximiser, only a little bit better." The world's best atheletes anxiously await the arrival of LEG into the marketplace, where users will certainly get a leg up on their competition. With four legs we can expect to almost double that speed. The stupidity, it blinds us. I would like to see a video of this if it exists. Funny, that foot seems a bit backwards. Not sure about you but my wrist wont bend that way. Someone needs a physiology lesson. For photo 2 to be real, the girl in photo 1 would have arms long enough to touch her knees while standing straight. On the first picture, the left upper arm looks to be longer than her upper leg. Also, look where the elbow is expected to bend, it's away from the "knee". I'm so glad the creators of that "technical details" chart were thoughtful enough to clearly label the thing called "arm". Now if they had just done as much to explain how this ridiculous thing works, I'd be all ears. I thought three legs was enough. What will science bring us next?